SAN CLEMENTE, Calif. -- A BMX rider in San Clemente was airlifted to safety after he was impaled by his bike, the Orange County Fire Authority said. Fire officials said the incident happened just south of Calle Extremo and Avenida Fabricante at about 3:20 p.m. on Saturday. A 26-year-old San Clemente man was riding his bike, going over jumps when the seat of his bike fell off mid-air, officials said. During the crash, firefighters said the bar holding the seat impaled the man in his stomach. The bike rider was with friends at the time of the crash and they were able to flag down a nearby animal control officer who immediately called 911. Emergency crews arrived at the scene and called for a helicopter to take the man to the hospital. 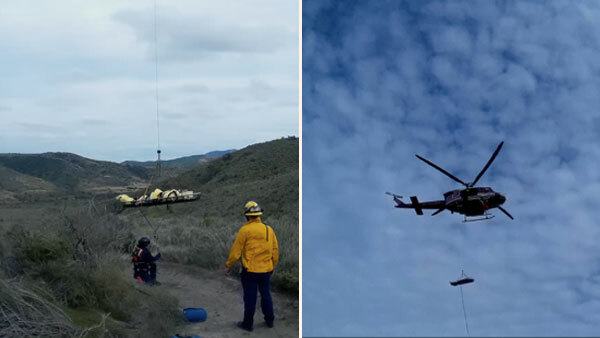 Since the man crashed near large power lines, firefighters had to move the man to an area where the helicopter could lower a basket and hoist him up. The man was flown to Mission Hospital with a severe abdominal injury, including internal injuries. Fire officials said he's listed in serious condition but is expected to survive.